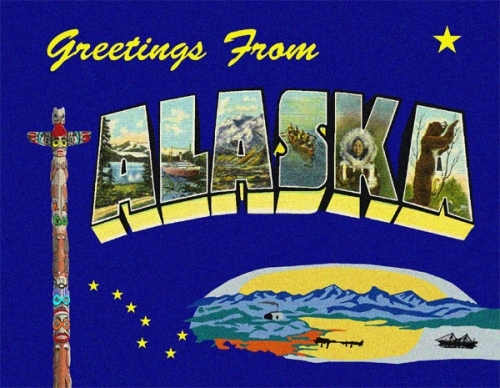 Greetings From Alaska Postcard - Custom original only available at Legends' General Store. Text on back: Greetings From Alaska! The “Last Frontier” provides breath-taking ocean coasts, rushing rivers, rain forests and majestic mountain peaks. For adventurers – drive a mush dog sled team, fish for the largest King Salmon in the world, hike the frontier. From Anchorage to Valdez, breathtaking scenery, rich history, and entertainment abound in the "Land of the Midnight Sun." Postcard is brand new and in mint condition.